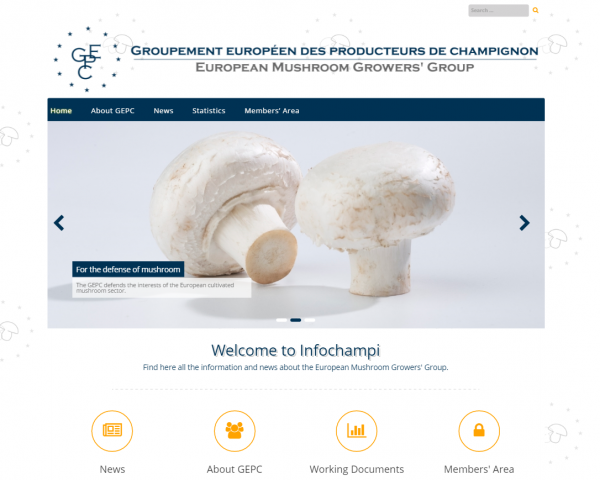 This website provides general information about the GEPC and its activities, news of the group and the mushroom sector, statistics, and a lot more. .
We wanted to make it more complete and more user-friendly. The website’s homepage features the traditional GEPC (blue) color, a modern and responsive layout, and a slider animating the page. The logo has been modernized, to reflect the European dimension of the Group. The GEPC website is now divided into five main sections: About GEPC, News, Statistics and Members’ Area. About GEPC will offer you information about the Group’s history, purpose and members. In the News section, you will be informed of the latest news concerning the GEPC and the mushroom sector: meetings, events, legislation, etc. In the Statistics section, you will find international mushroom flows and production figures. The private Members’ Area section is for GEPC members only so they can access working documents. You know what you are looking for, but not where to find it? The Search bar in the top-right corner of each page will help you find exactly what you want. Any questions or comments? The Contact form is here for you.